There is something about a quirky print that always brings a smile to my face, and this lip print sweater from The Shopping Bag is especially cheeky. If you have yet to hear of the Shopping Bag, they are an online boutique which strives to provide a variety of unique items at attainable price points. Their goods rages from housewares, to beauty, to clothes and jewelry and seldom does an item cost more than $100. I love their nautical inspired items, like this adorable striped dress, and cute anchor ring. Feeling sad you missed out on Lilly for Target? I bet these pineapple jars will cheer you up! Another highlight of the Shopping Bag is that many of their clothing items, such as the aforementioned striped dress, are made in the USA, so be sure and keep an eye out. I hope you take a look around The Shopping Bag and should you find something you love, be sure and use the code CHICONTHECHEAP for 25% off your order! Code expires May 24, 2015. Great outdit. This pencil skirt looks gorgeous! That sweater is so adorable!! I love the red pumps too! 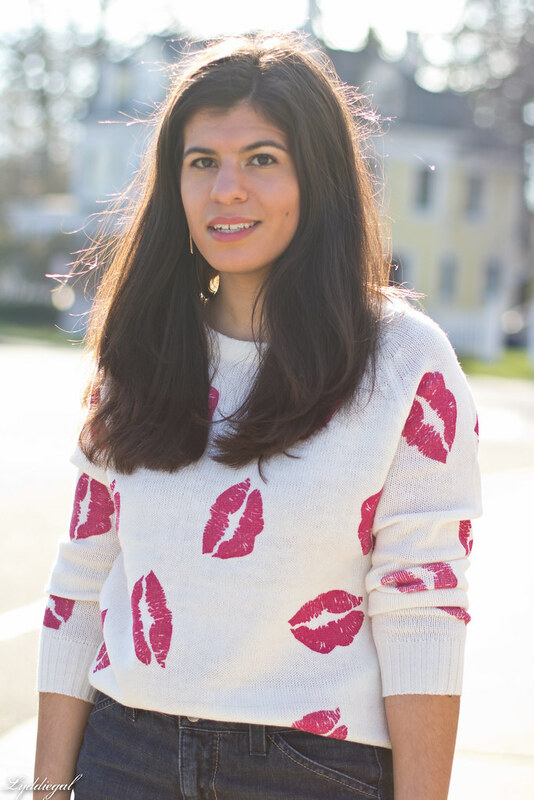 I got my fur vest from The Shopping Bag this winter but I have yet to checkout their new arrivals for spring - considering how adorable this lip print sweater is (and how fast I know their stock runs out!) I think that I'd best do it in a hurry. But first, I have to say that I think you might be the only person I know who can make a denim skirt look sophisticated. What is your secret? What a lovely post turned out, I enjoyed a lot! This sweater with lips looks really nice;) I d love the way you've styled it. Love that fun print on that sweater. I think you styled it perfectly. Cute pumps! I love the sweater and you look fab! Have a great weekend! I feel like we just did this recently as well, but I am also wearing a denim pencil skirt in real life today! LOL This sounds like a cute company--I am a sucker for nautical prints. Love this sweater! Great with the hot pink heels! So fun, what a great sweater- works well with the skirt. I just remembered I have a denim skirt that i have not worn in a while. Oh and of course I will be checking the SBag out. This looks is so fun! 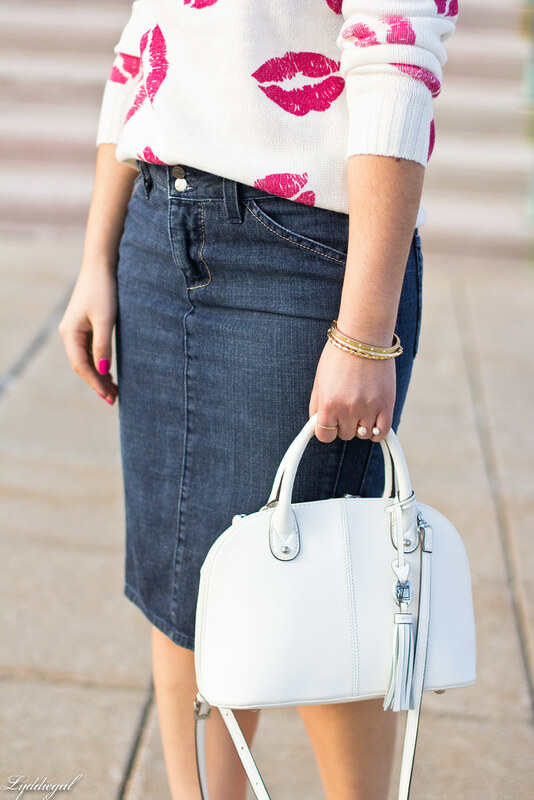 I love the sweater and your handbag, they really pop against the dark denim skirt! In love with this outfit!!!! That sweater would bring a smile to my face also! It is so cute and I really like how your let it be the standout piece of this outfit. This is a great outfit! I'm the same. I have soft spot for it. Got this weekend lip print on my nails. I like how you paired your sweater with midi denim skirt. Gorgeous look. Very fun look! 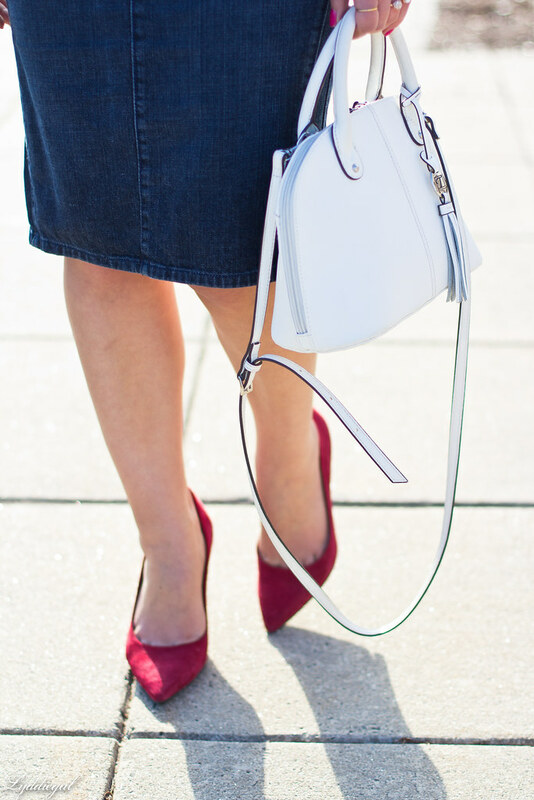 Love the denim pencil skirt. I think I should take mine out of the back of my closet! What a fun top! And your red heels compliment it so well! The Shopping Bag has the most awesome stuff on the planet - and this cute lips top is no exception! Super cute sweater! Love the look! The print of your sweater is so cute, I love it! That sweater is darling. I love a good cheeky print. This sweater is absolutely adorable! So in love with the print and it's perfect with the denim skirt! What a fun sweater--I love that lip print! Love how that and those heels really add pop to that denim pencil skirt, they really take it up a notch. That skirt is fantastic by the way, it looks great on you!! Cute jumper and I love those shoes too!